Ernest was born on 21st July 1890, at Oakley Nr Chinnor; the middle child of eight, born to Henry and Eleanor House. By 1901 Henry was a schoolboy and the family were living at 14 Chinnor Road, Thame. Ernie was educated at Thame Royal British School and by 1911 he was working as a porter at Thame Workhouse. On 16th May 1912 Ernest resigned from his job at the Workhouse and eight days later he sailed on RMS Virginian to Montreal, Canada. He was working as a decorator when he enlisted on 28th September 1914 in the Canadian Expeditionary Force and served with the 14th Montreal Battalion. He left for England with the first contingent of Canadians in October 1914 moving to France in February 1915. 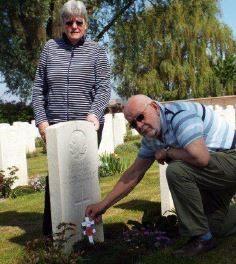 He was killed “by a shell that landed in his trench” near Messines, Belgium on 30th November 1915 and is buried at La Plus Douve Farm Cemetery, Hainaut, Belgium. He is remembered in Thame on the War Memorial and on St Mary’s Church, All Saints Church and Christchurch Memorial Boards.